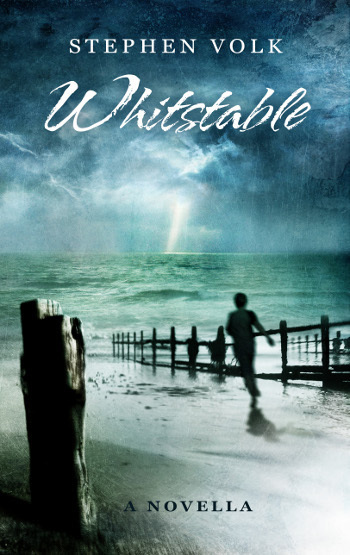 First, here’s a little article about Peter Cushing and Stephen Volk’s Whitstable that appeared yesterday at Gef Fox’s Wag the Fox blog, written by Simon Marshall-Jones of Spectral. The article gives an insight into the actor and why Stephen wrote the novella, as well as what drives the narrative. You can read the piece here. As many of you will know, this year will see the publication of This Spectral Season, a single volume gathering all eight chapbooks from Spectral’s first two years, together with some new material from each contributor. The volume will be available as an unlimited paperback and an eBook.. In addition to those, there will also be a very limited edition of TEN sets of all eight chapbooks in their original format, signed and presented in their own slipcase. 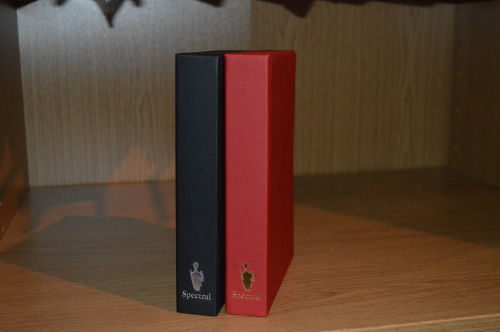 The slipcases are hand-covered in red Wibalin cloth with the Spectral logo gold foil stamped on the spine, and the contents held in by a custom obi strip, printed on fine quality paper as befits such a piece. Publication date has yet to be set – but is most likely to be this summer. Watch out for further details! Talking of slipcases, the standard ones are still available for order – black Wibalin cloth with the Spectral logo silver foil stamped on the spine. They are designed to keep all those lovely chapbooks pristine and in order, plus they look absolutely magnificent displayed on the bookshelf! Just pop on over to the Spectral Shop to buy one today!